Only 1 In Stock Order Today! This Jump'n Dodgeball inflatable bouncer is constructed of a durable 320D oxford nylon material. This bounce house includes an air blower, and four soft neoprene dodgeballs. 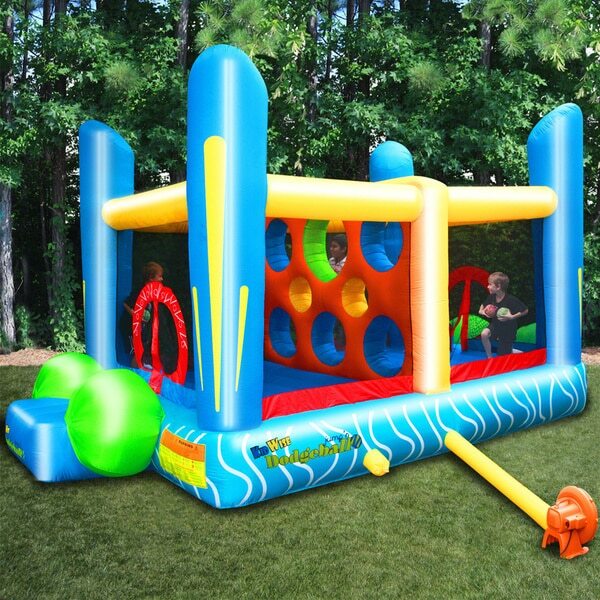 Kids will have many hours of fun in the back yard while bouncing and jumping to avoid the dogeball. This is great for parties, sleep overs and just any other day. Recommended for ages 3 years and up. 1) We offer free shipping to the lower 48 states. International orders will incur a $5.00 shipping surcharge that will be billed separately via PayPal. 2) Orders are shipped on business days only (Mon. – Fri.) & are shipped within three business days of payment, usually sooner. Weekends and Federal Holidays excluded. 3) Please have complete name, correct shipping address, and contact phone number on payment invoice. 4) We are not responsible for non-delivery due to an incorrect shipping address. 5) Please make sure your physical address and email address on file is up to date and valid. 6) We will supply the tracking number for your order to PayPal and eBay as soon as it is generated. 7) We reserve the right to ship from 3rd party suppliers. 9) All items are in stock at the time of listing. Inventory on eBay changes constantly and it is impossible to maintain a perfectly accurate count of all items. 10) Please feel free to send a message. We try to answer all inquiries as promptly and accurately as possible. Returns and Refunds are subjected to a 20% restocking fee Buyer is Responsible for Return Shipping Cost.